The National Action Plan for Conservation of Migratory Birds and their Habitats along Central Asia Flyway (2018-2023), lays significant thrust on protection and conservation of habitats around Chennai. 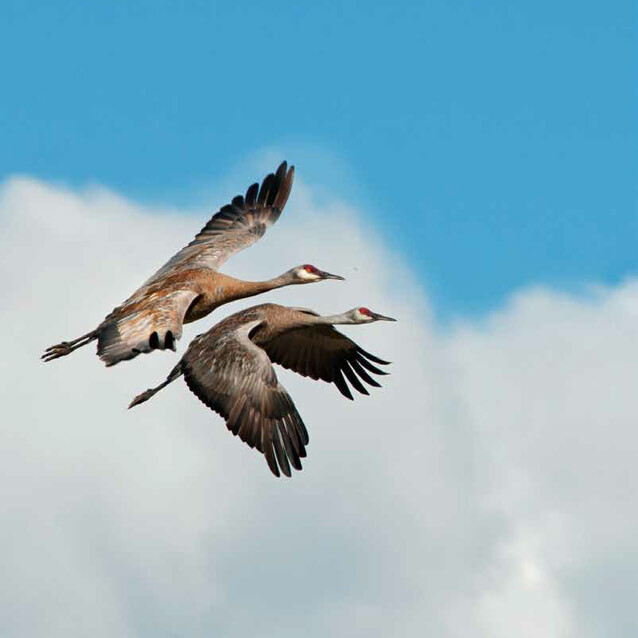 These are locations that serve as a convenient stopover and wintering area for migrating birds. India is a critical country in the Central Asian Flyway Zone (CAF) and supports about 257 species of birds. Of these, 81 species are migratory birds of CAF conservation concern, three critically endangered species, six endangered species and 13 near threatened species. 1% biogeographical population of any long distant migratory waterbird species must stopover at the site. One or more individuals of any Critically Endangered migratory bird species must stopover at the site. More than 50 individuals of any Vulnerable / Endangered migratory waterbird species must stopover at the site. More than 100 individuals of any Near -Threatened migratory waterbird species must have been spotted at the identified site. Congregation of greater than 10,000 long distant migratory birds at any period of the season in the identified site. Congregation of greater than 15,000 local/short distant migratory waterbirds in the identified site. 20 species of migratory birds together on a single day or within a weeks’ time spotted in the site. 40 or >40 migratory waterbird species over the migratory season spotted at the site. Southward passage (August to October) Congregation more than 2000 Long distant migratory waterbirds spotted in the site during the season. Wintering (November to February) regular occurrence of more than 5000 migratory birds spotted in the site during the season. Northward Passage (March to May) A small congregation 1000 Long distant waterbirds spotted in the site during the season. South Ward passage & Wintering Additional population and species during southward passage besides the wintering population spotted in the site during the season. Wetlands with reed-bed / bordered with grasslands/ peripheral shrubs which provide roosting and feeding grounds for thousands of migratory land birds such as warblers, starlings, buntings, wagtails, larks. The following are some known birding hotspots in and around Chennai. Over 100 resident and migratory bird species have been recorded so far, the commonest raptors being: Oriental honey buzzard, white-eyed buzzard and shikra. Migratory raptors including black baza, common kestrel and booted eagle can be seen during the winter months. Resident birds include red-vented bulbul, red-whiskered bulbul and white-browed bulbul, coppersmith barbet, sunbirds, yellow-wattled lapwing, Indian robin, lesser flameback woodpecker and spotted owlet. This is one place in Chennai where the black-capped kingfisher has been recorded. Purple rumped sunbird ath the Theosophical Society. Some of the resident bird species seen here are lesser flameback woodpecker, coppersmith barbet, hoopoe, southern coucal, rufous treepie, Asian koel, sunbirds, yellow-billed babbler, common hawk-cuckoo, shikra, spotted owlet, spotted dove, rose-ringed parakeet, common kingfisher, pied kingfisher, white-breasted kingfisher and Oriental honey buzzard. During winter one can see Indian paradise flycatcher, Asian brown flycatcher, brown-breasted flycatcher, Indian pitta, Blyth’s reed warbler in the TS gardens, and in the estuary herons, egrets, sandpipers, black-winged stilt, godwits and plovers can all be seen. Resident bird species seen here include lesser flameback woodpecker, coppersmith barbet, hoopoe, greater coucal, rufous treepie, Asian koel, sunbirds, yellow-billed babbler, common hawk-cuckoo, shikra, spotted owlet, spotted dove, rose-ringed parakeet, common kingfisher, pied kingfisher, white-breasted kingfisher, collared scops-owl, Asian openbill stork, brown hawk-owl, slaty-breasted rail, white-breasted waterhen, purple moorhen, common moorhen, blue-faced malkoha, red-vented bulbul, white-browed bulbul, red-whiskered bulbul and Oriental honey buzzard. During wintering months one can see Indian paradise flycatcher, Asian brown flycatcher, Indian pitta, orange-headed ground thrush, large-billed leaf warbler, Blyth’s reed warbler, and forest wagtail in the IIT campus. Highlights: Fulvous whistling duck, grey-headed lapwing, greater flamingo and waders like pied avocet, sandpipers and ruffs can be seen here during wintering months. Resident bird species include purple swamphen, common moorhen, pheasant-tailed jacana, purple heron, black-winged stilt, common coot, spot-billed duck, spot-billed pelican, prinias, common kingfisher, pied kingfisher, pied crested cuckoo, white-breasted kingfisher and grey heron. Raptors like shikra, black-winged kite, black kite, red-necked falcon, marsh harrier, Montague’s harrier and booted eagle can also be seen here. During wintering months thousands of waders and migratory ducks fill the marsh, which becomes a paradise for bird watchers. Osprey, greater flamingo, northern pintail duck, northern shoveller, garganey teal, black-tailed godwit, pied avocet, common sandpiper, wood sandpiper and marsh sandpiper, whiskered tern, rosy starling, yellow wagtail, little stint, grey-headed lapwing, glossy ibis and black-headed ibis, ruff and greenshank all visit the Pallikaranai marsh. Highlight: The great horned owl is the star attraction in Nanmangalam Reserve forest. Orange-breasted green pigeon was seen recently for the first time. Resident bird species include Indian robin and magpie robin, common kingfisher, pied kingfisher and white-breasted kingfisher, great horned owl, common iora, purple-rumped sunbird, purple sunbird and Loten’s sunbird, spotted dove and laughing dove, Indian nightjar, Eurasian stone-curlew (thick-knee), ashy woodswallow, common woodshrike, blue-faced malkoha, common babbler, red-whiskered bulbul, red-vented bulbul and white-browed bulbul, Oriental honey buzzard, white-eyed buzzard and shikra. During the wintering months Indian pitta, rosy starling, orange-headed ground thrush, Indian paradise flycatcher, Asian brown flycatcher, common kestrel, booted eagle, common snipe and blue-tailed bee-eater can all be seen. Highlights: Indian courser are recorded to breed here. uncommon raptors such as red-necked falcon and short-toed snake-eagle can also be spotted. Some of the resident bird species include little green bee-eater, pied bushchat, ashy-crowned sparrow-lark, paddyfield pipit, yellow-wattled lapwing, red-wattled lapwing, Indian courser, common kingfisher, pied kingfisher, white-breasted kingfisher, little ringed plover, red-rumped swallow, shikra, white-eyed buzzard, red-necked falcon, short-toed snake-eagle, baya weaver, zitting cisticola, plain prinia, ashy prinia and Indian roller. During winter months blue-tailed bee-eater, common kestrel, yellow wagtail, barn swallow, glossy ibis, black-headed ibis, Eurasian spoonbill, painted stork, openbill stork, booted eagle, Oriental pratincole, common sandpiper, wood sandpiper and greenshank can be spotted. Highlight: Hundreds of Eurasian wigeon, fulvous whistling duck, peregrine falcon, and cotton teal are recorded during winter. Red-necked falcons and golden jackals are recorded breeding in the open dry patches around the lake. Resident bird species include pond heron, little cormorant, purple heron, spot-billed pelican, ashy woodswallow, little grebe, little green bee-eater, white-eyed buzzard, spotted owlet, Oriental darter, little egret, great egret, common coot, purple moorhen, white-breasted waterhen, bay-backed shrike, pied bushchat, grey francolin, ashy-crowned sparrow-lark, paddyfield pipit, black drongo, plain prinia, ashy prinia, black bittern, shikra, red munia, tricoloured munia, Indian silverbill, pheasant-tailed jacana. During the wintering months common kestrel, Montague’s harrier, blue-tailed bee-eater, barn swallow, Eurasian wigeon, cotton pygmy goose, fulvous whistling duck, painted stork, openbill stork can be spotted. Highlights: Thousands of gulls and terns are recorded during the winter months. Eurasian curlew, whimbrel, greater flamingo, great crested tern, Sandwich tern, white-winged black tern can be spotted during February and March. Black ibis were recorded for the first time in Chennai recently. The resident birds seen here include little cormorant, spot-billed pelican, little grebe, common kingfisher, pied kingfisher, white-breasted kingfisher, little green or striated heron, little green bee-eater, black drongo, red-wattled lapwing, pond heron. Thousands of waders can be seen here during winter. Some of the winter migrants seen here are common tern, little tern, whiskered tern, gull-billed tern, great crested tern, Sandwich tern, white-winged black tern, Caspian tern, brown headed/black headed/Pallas gulls, Kentish/lesser sand/Pacific golden/grey plovers, common sandpiper, wood sandpiper, curlew sandpiper, Terek sandpiper, Eurasian curlew, whimbrel, osprey, little stint, Temminck’s stint, dunlin, black-tailed godwit, common redshank, greenshank, painted stork, openbill stork and grey heron. Highlights: Heronry and wintering ducks. The bird species that nest here include painted stork, grey heron, Eurasian spoonbill, darter (snakebird), little cormorant, spot-billed pelican, black-headed ibis, glossy ibis, little egret, intermediate egret and great egret, black-crowned night heron, pond heron and Asian openbill stork. Hundreds of garganey teals, northern pintail and northern shoveller can also be seen in the lake. The best time to visit Vedanthangal Bird Sanctuary is from November to March. Highlights: Hundreds of greater flamingos can be spotted here throughout the year. Thousands of migratory ducks, terns and waders can also be spotted during winter months. The resident birds seen here include little cormorant, spot-billed pelican, little grebe, common kingfisher, pied kingfisher, white-breasted kingfisher, little green or striated heron, pond heron and red-wattled lapwing. Some of the winter migrants seen here are greater flamingo, Kentish plover, lesser sand plover, Pacific golden plover, grey plover, common sandpiper, curlew sandpiper, Eurasian curlew, osprey, little stint, Temminck’s stint, black-tailed godwit, common redshank, greenshank, common tern, little tern, whiskered tern, gull-billed tern, Caspian tern, brown-headed gull, Pallas’s gull, slender-billed gull, painted stork, openbill stork and grey heron. Thousands of Eurasian wigeon, northern pintail, northern shoveller also use the backwaters. Highlights: Elusive bird species like slaty-breasted rail and ruddy-breasted crake can be spotted here. For the first time in Chennai, a rufous-rumped grassbird was recorded here. Some of the resident bird species that can be seen here are little green bee-eater, blue-tailed bee-eater, plain prinia, ashy prinia, zitting cisticola, greater coucal, pied cuckoo, common kingfisher, pied kingfisher, white-breasted kingfisher, white-breasted waterhen, ruddy-breasted crake, slaty-breasted rail, tricolored munia, Indian silverbill (white-throated munia), scaly-breasted munia, red munia, paddyfield pipit, yellow bittern, black bittern, purple-rumped sunbird, purple sunbird, clamorous reed-warbler, pied wagtail, Asian palm swift, pond heron, black-shouldered kite, spotted dove and laughing dove. Wintering species like booted warbler, Blyth’s reed warbler and common kestrel can also be seen. Highlights: Heronry and waders during the winter months. Uncommon butterflies like painted lady and black rajah have also been spotted here. Some of the resident bird species that can be seen here are little cormorant, black-crowned night heron, little grebe, sunbirds, common kingfisher, pied kingfisher, white-breasted kingfisher, black-capped kingfisher, lesser whistling teal, white-breasted waterhen, cinnamon bittern, black bittern and little green bee-eater. The wintering species that visit the estuary are black-winged stilt, common sandpiper, wood sandpiper, black-tailed godwit, little ringed plover, lesser sand plover, Pacific golden plover, whiskered tern, gull-billed tern, little egret and great egret. Highlights: Thousands of greater flamingo, lesser flamingo, wintering ducks and waders have been recorded during the winter. White-bellied sea-eagle, osprey and booted eagle can also be seen. Some of the bird species spotted here in winter include greater flamingo, lesser flamingo, northern pintail, northern shoveller ducks, sandpipers, plovers, terns, gulls, osprey, painted stork, Asian openbill stork, glossy ibis, black-headed ibis, western reef egret, little egret, intermediate egret, great egret, greenshank, common redshank, spotted redshank, godwits, pied avocet, Eurasian curlew, spot-billed pelican, stints, peregrine falcon and common kestrel. Highlights: Heronry and wintering ducks. The bird species that nest here include painted stork, grey heron, Eurasian spoonbill, darter, little cormorant, Indian shag, spot-billed pelican, black-headed ibis, glossy ibis, little egret, intermediate egret, great egret, black-crowned night heron, pond heron and Asian openbill stork. Hundreds of garganey teal, northern pintail, gadwall and northern shoveller can also be seen on the lake. The best time to visit this place is from November to March. The Ministry of Environment and Forests is the nodal agency for developing strategy and action plans and managing national, regional and international programmes on water birds and wetlands conservation. Implementation of action plans is through the states environment and forests agencies with complementing activities provided by many academic institutions, NGO-conservation organizations, professional institutions and international agencies. National government institutions involved in migratory waterbirds and wetlands research/management include: Zoological Survey of India, Sálim Ali Centre for Ornithology and Natural History, Wildlife Institute of India, Indian Institute of Forest Management, Centre for Environment Education, Indian Institute of Economic Growth, Indira Gandhi Institute of Development Research and the Indian Council of Agricultural Research.The Bombay Natural History Society is the foremost NGO in India working on water birds and wetlands. India has identified more than 300 potential Ramsar sites, of which 25 have been implemented. India is signatory to Central Asian Waterbirds Flyway Action Plan, Convention on the Conservation of Migratory Species (CMS), Agreement on the Conservation of African-Eurasian Migratory Waterbirds (AEWA), Convention on Wetlands of International Importance (Ramsar) and Convention on Biological Diversity (CBD) and development agencies including United Nations Environment Programme (UNEP), United Nations Development Programme (UNDP), World Bank and Asian Development Bank (ADB) and international Non-governmental organizations including BirdLife International, World Conservation Union (IUCN), World Wide Fund for Nature (WWF) and Wetlands International who all cooperate on regional and national wildlife conservation.